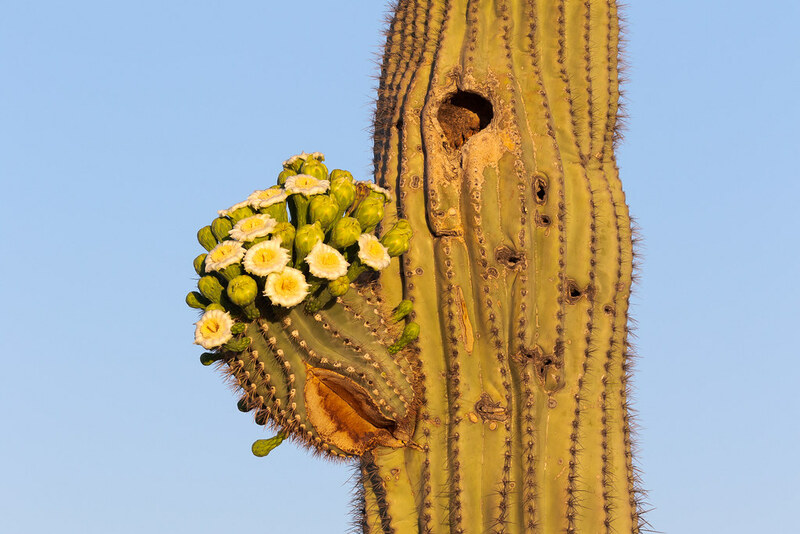 This saguaro offered up a bouquet of flowers near sunrise on Mother’s Day. I had hopes of photographing it again with all the flowers open but by the time I could return the following Saturday, all of the blossoms were gone and I learned another fact about my new home. The flowers only last about a day, first opening at night to attract bats with their nectar and closing the following afternoon after the bees and birds have had their fill. If pollinated during that short window, the fruit below will develop during the summer. This entry was posted in Plants and tagged Arizona, blossom, Brown's Ranch, cactus, desert, flower, McDowell Sonoran Preserve, Off-map Trail, saguaro, Scottsdale, Sonoran Desert. Bookmark the permalink.